You may think that negative SEO is unreal but it is not so. Though a site can’t be destroyed but it can definitely be managed through use of harmful backlink and a procedure called backlink spamming. This is a legal danger which can lead to lost organic search, revenue and visibility. But you will be thankful enough to know that it is possible to defend against negative SEO and there are various steps that you can follow in order to save your website. Read on to know what negative SEO is and how you can defend against it. If you didn’t know what negative SEO is, it is the procedure incorporating black hat SEO techniques on some other website. Generally some disgruntled competitor will unleash an SEO attack against his competitors in order to reduce their website rankings. Majority of the search engine optimizers are happy to abide by the rules of SEO. The rule is to publish content, promote on social media and to roll with the latest Google algorithm updates. However, there are times, not often though, that you get on the wrong side of someone who doesn’t share your scruples and they are the ones who play dirty. They are the ones, who bog down or try to spoil your website with several spammy links, make Yelp full of fake reviews or even hack your website. 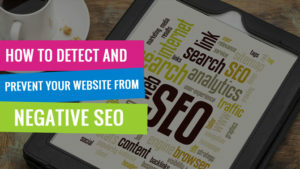 Regardless of whether you’re a victim or you just want to protect your site against a potential attack, here are few things you can do to defend your site against negative SEO. Regular link audits are one of the best practices for all businesses but they can best save your website from any kind of negative SEO attack. If you can monitor your link profile, this is definitely the best ways of spotting any kind of suspicious activity before it soars out of control. In case your website has been hacked, your links will also suffer. The attacker might have altered your content and also included spammy links to redirect their links. Therefore, it’s crucial that you monitor the growth of link profile carefully so that you can easily spot and attack before it costs you big time. The speed of the site is one of the main ranking factors and if you have recently noticed that your website has become slow and sluggish, you should immediately use crawling software to check whether or not there is anything suspicious. If you see that there’s no problem anywhere but you still see the site speed to be too slow, you can be sure that you’re a victim of forceful crawling. When this happens, this means heavy server load and it may even lead to a crash. Content marketing has always been the name of the game but all are not creative in an equal manner as long as content creation is concerned. This is why content copying or content scraping has become extremely common. This is the illegal process of lifting or copying content from a website and attaching it to your website in the same form. The attacker claims that it is their own content. Scraping of content may have crucial consequences as your page might not get valued in case the copied content gets indexed before your page. Therefore, if you’ve been wondering about the different ways in which you can defend your website from negative SEO, you can certainly follow the above mentioned strategies and techniques.